KEEP WATCHING THE WEBSITE FOR UPDATES. The Maffra-Sale Motorcycle Club caters for range of motorcycle disiplines with motocross probably being the main activity at our well-equipped facility at Newry. There is also a very strong vintage section who run the swap meet at the Sale Showgrounds each year. There are also members who trail ride and we held a very successful Great Divide Trail Ride this year which is an annual event. There has also been some road race members from time to time. At the moment the club committee and executive positions are made up of members involved in the motocross side of the club and therefore general meetings are run predominantly by the motocross side of the club. This is not the way it has to be or the way it should be. All members should feel free to come along and have their say and also be encouraged to take up positions. Recently there has been criticism that the club is not running any motocross club events or a club championship which is a fair criticism as this is true. The reason for this is that the only people who seem to be prepared to do the work to run these events are the same ones who have been doing it for years. There is a lot of work involved in running a club event at the track that people generally don’t see. There are many hours spent on the track, ripping and grading to prepare the surface and the watering prior the day which is generally done by one or two people not to mention the cost of fuel and running cost of the tractor to do this. Then there is the cleaning and stocking up of the canteen prior to events and the constant work to cook and serve food all day and then clean up and empty bins. The reason there is nothing going on during the year is that most of the people who are left to run these club events have been doing so for many years and now find themselves busy doing other events like Gippsland, Victorian and even national championships, which is their reason for being involved in the club in the first place and to do these events, especially a national level is a huge drain on their time and finances. If you find you are one of those members who are interested in the club and wish there were more events at Newry or even different events like off-road events then come along if you’re prepared to help or even run these events. We are happy to help in any way we can and want the club to continue and to prosper in the future. 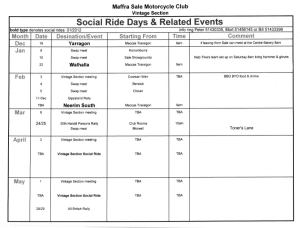 The Maffra-Sale Motorcycle Club has been around since 1947 and is one of only a few clubs to have operated continually in that time. We have had some very successful riders in that time most notable Shane Watts with a Enduro World Championship in 1997 and most recently Cody Dyce with an Australin junior championship this year. 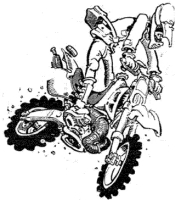 Back in the 90’s we had quite a strong membership and a really good club championship which consisted of off-road and motocross events and were well attended events. These stopped when public liability insurance and council requirements made these events too difficult to run but recent changes would now make these events feasible once more but we need people to help run them. Once again I urge all members to step up and take the club into the future. This is a great club with a great history and great people. It needs to continue. Please attend the AGM on Monday the 1st of December at the Morrison street club rooms in Maffra at 7:30pm and help your club. This is your club not the committee's. On behalf of the Maffra-Sale Motorcycle Club committee. Membership forms for both Vintage section and MX are now available for down load. Lock bikes in the garage/trailer out of sight. Secure a heavy chain to the floor using heavy duty padlocks to secure the bike. (Thieves MAY still get the bike, but, they are likely to make more noise and take more time to commit the offence therefore increasing the opportunity they will get caught. A lot of theft is opportunistic. Record all identifying features such as serial or vin and engine numbers and rego (if applicable), and extra's added to your bike or distinguishing marks/stickers etc. Consider the use of CCTV (some cheap options are now available), audible alarms, security lighting and Data Dot marking technology. Promptly report any suspicious behaviour to the police with details of the person or vehicle, time, date and place. Don't leave the keys with the bike. As you know bikes are a target, sometimes they are stripped down and moved on quickly. So focusing on preventing the theft in the first place is the key. Theives are not only targeting the Motocross type bikes but farmers also are having their ATV's and machinery/tools stolen as well. So be vigilant, and precaucious and help keep your equipment safe. Genreal Swap Meet for anything people May Want to sell. On Site cartering, including breakfast.